I have been doing a little reading that last few days about which plugs to run, and what seems to work. Like most other automotive related questions, there are mixed reviews and feelings on which plugs seem to do well. After some reading I'm thinking about trying some Copper plugs. I know they'll foul at (at least from the reading) in 3-5k miles, which doesn't concern me, especially if they're going to perform as well as what has been stated. I've only had one other turbo car, and ran the NGK BKR7e I believe, they seemed to work well, but I want the best performance possible. What's everyone else running? Any plugs you prefer over another? Hopefully we can get some good information out of this thread. Last edited by granth; 02-23-2011 at 09:16 AM. funny was just talking about this on another post in the B6 forum. I just changed over to the NGK 5238's. Idle is a lot smoother... no misfires, powerband feels great also. I have tried a ton of plugs and these are my fav so far. I personally run Bosch FR5DTC's. They last me about 5,000 miles on E85 and I wouldn't go with any other plug. I tried running the NGK BKR7E's but they kept on fowling and giving me misfires. Read this about plugs and coils. Good comparisons on the dyno. 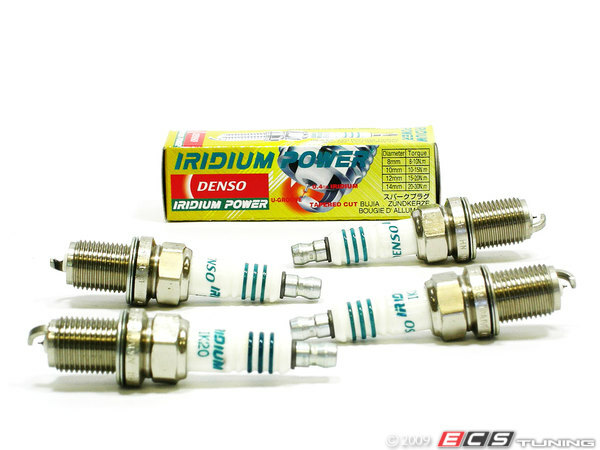 Iridium plugs have equal to or better performance when compared to copper plugs the biggest difference is they last longer. We have them available below. He has an '00 and I'm assuming Hitachi Rev E bolt downs which are weaker coils than yours. I wonder how effects the decision for plugs. Specifically, NGK 5238s (r5671a-9) - a 9 heat range plug.